Summary: During the Second World War a Nazi project involves some kind of dark magic. At the same time of the ritual, Hellboy is summoned. Now, years later, Hellboy helps a bureau of paranormal investigators. – I can’t wait to learn more about Hellboy’s origins, and what will happen to him in the next few books. Verdict: Good start of a series, dives right into it instead of only setting up the overarching story. Beautiful shadowy art, can’t wait to read the next one. Hellboy is one of the most celebrated comics series in recent years. The ultimate artists’ artist and a great storyteller whose work is in turns haunting, hilarious, and spellbinding, Mike Mignola has won numerous awards in the comics industry and beyond. When strangeness threatens to engulf the world, a strange man will come to save it. 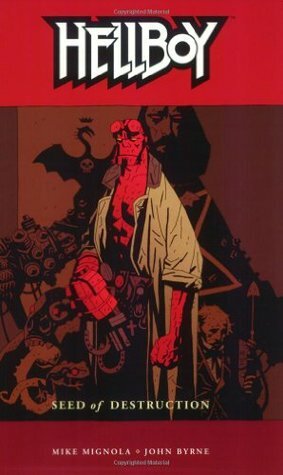 Sent to investigate a mystery with supernatural overtones, Hellboy discovers the secrets of his own origins, and his link to the Nazi occultists who promised Hitler a final solution in the form of a demonic avatar.